Yesterday, Full Moon Day/Valentine’s Day, I took a day trip to nearby Montserrat, famed mountain of Catalan dotted with sacred sites, hermitages and churches, as well as the beautiful Basilica of Santa Maria de Montserrat. I got up the easy way, taking the Aeri, which just zipped a cable car full of us tourists up the mountain. In the late afternoon, an hour and half before sunset, I decided to walk down to the pueblo of Montserrat, where I could take my train back to Barcelona. Easy enough, I thought. 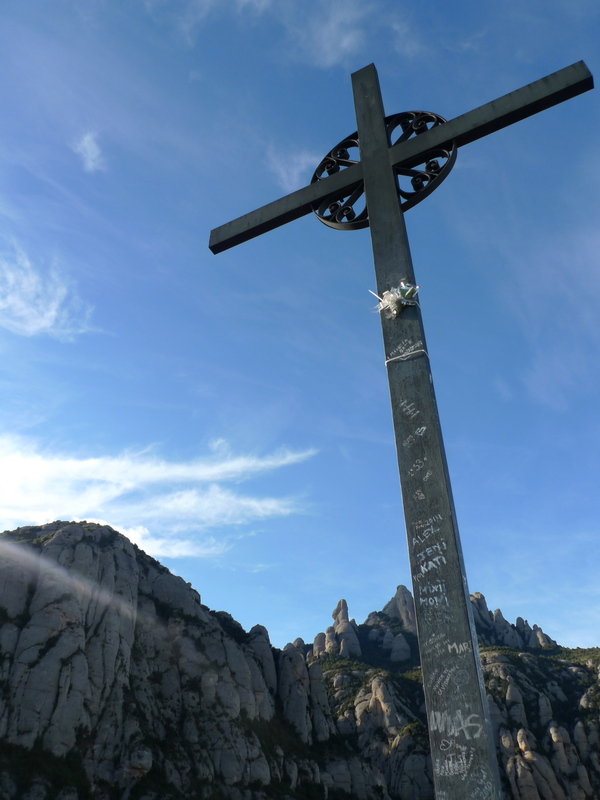 It’s interesting how I little understood the hugeness of Montserrat, the height of it, until I took the time to walk it. Not even a quarter of the way down on a narrow, zig-zagging dirt path on edge of the cliffside of the venerable mountain, looking at the dot-like municipality of Montserrat far far down below, I start to freak out just a little bit. I start to wonder: can I get there before sunset? What if something happens to me, what if I trip and twist my ankle? I am out here on my own and have not seen another soul on this little road. I debate whether I should scale back up the path, take the Aeri or the furnicular down, like the rest of the reasonable tourists–none of whom seemed to hatch up the same plan as myself. This is when the yoga kicked in for me. This is when I start to breathe slowly, when I start to bring mindfulness back into every step. I reason with myself: isn’t this, after all, what I wanted when I set out that morning, to spend time with myself, myself and the mountain? Like yoga practice, some paths are meant to be walked alone. There are times when we have companions and times when we have guidance. Then there are the other times: when practice is a lonely road. It is useless to panic and counterproductive to back track. We simply need to move forward and enjoy the gift of isolation. Practice can be a wonderful community experience, one connected to the collective. But it can also be a lonesome road. When that time comes–and it is a sacred and precious time–we must be brave to walk that path alone. PHOTO: Spectacular view from Montserrat, as I start to make my way down this awesome mountain. INNER DANCE – DANZA INTERIOR es una practica que tiene el proposito de ayudar el ser humano a desmantelar patrones de pensamientos y comportamientos, alcanzar la expanción interior y cultivar una relación sana con el YO, su entorno y el planeta. A través de la ciencia de la musica, la vibración y la meditación en movimiento, utilizaremos esta poderosa practica con el objetivo de cambiar y eliminar bloqueos físicos, mentales y emocionales de nuestro cuerpo energético. La musica y la conexión con el nuestro interior, nos permitirá observar los movimientos sin pensar. La danza no tiene una estructura, forma o reglas. La danza puede ser dinámica o estática, silenciosa o ruidosa, suave o intensa. Cada danza es una apertura y una invitación al aprofundamiento personal y universal a la vez. La practica será impartida en LA FLORESTA – BARCELONA, por KAZ CASTILLO. 15:30h – Paseo en el bosque de Collserola. Comida: Invitamos a cada participante traer comida para compartir. Hora de encuentro: 11:00 – Se ruega puntualidad. o escribir un correo a : js.julianasimoes@gmail.com.